Brotherhood Mutual is represented by independent agents who subscribe to a code of ethics based on scriptural principles and serve in churches and ministries of their own. The company consistently earns an A (Excellent) rating from A.M. Best, a leading authority in rating insurance companies. For additional information, visit www.brotherhoodmutual.com. 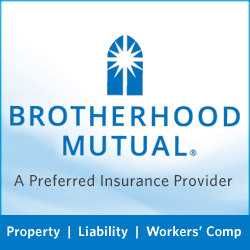 *Payroll services are provided through MinistryWorks®, a subsidiary of Brotherhood Mutual Insurance Company.